You Gotta Serve Somebody - Who is the Fed Serving?You Gotta Serve Somebody - Who is the Fed Serving? 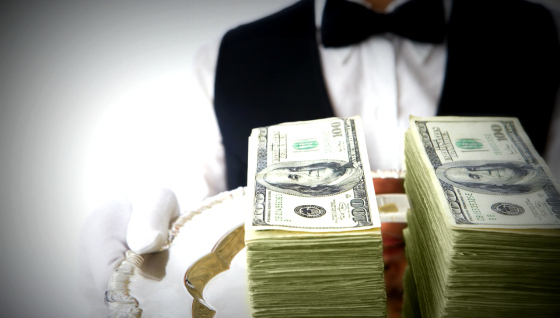 You Gotta Serve Somebody – Who is the Fed Serving? Bob Dylan said, “You gotta serve somebody.” The Federal Reserve is no exception. The Fed has the mandate to use its policy tools granted to it by Congress to help achieve full employment, stable prices, and moderate long-term interest rates (most people are not aware of the third mandate). With greater global interconnectedness, particularly in terms of enormous capital flows, sluggish growth outside of the United States, resulting competitive currency devaluations, and trillions of dollars of negative yielding fixed income securities, the Fed no longer has the luxury of ignoring global financial conditions. In fact, its actions and words are clearly affecting the global economy whether it likes it or not. If one were to look at the improving labor market as exemplified by consistent job growth, moderately improving wages, unemployment at 5%, and inflation seemingly having bottomed, there is clearly an argument for The Fed to continue to not pause in terms of raising short-term interest rates. This is what the Fed previously telegraphed when it alluded to four interest rate increases in 2016 when it raised rates for the first time in many years in December. The market didn’t like that. The dollar soared, commodity prices sank, risk appetites soured, stock prices tanked, and long-term interest rates came down. So what gives? The market told The Fed that it has a new master to serve: the U.S. Dollar. Global financial conditions could no longer be ignored. The relative island of prosperity that the U.S. economy had become was now becoming too much of a good thing. As the European Central Bank amps up its quantitative easing to weaken the euro, and moves deeper into negative interest rates, and China’s slower growth is putting pressures on its currency, the dollar has become an island in a hostile sea. Or at least, it had been until Janet Yellen took on a more dovish tone and signaled fewer interest rate hikes in 2016 last week. She cited global financial conditions as one of the principal reasons for ratcheting down rate hike expectations. The following chart shows the trajectory of the dollar and what a powerful rally that has taken place. 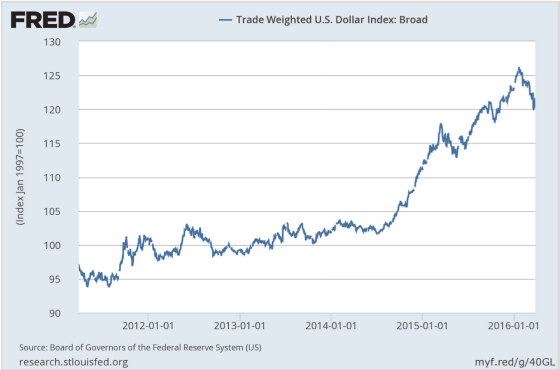 The dollar had been on a tear since mid-2014, up until the recent correction. This has led to a lot of pressure on multinational firms as the strong dollar was hurting American competitiveness. It was also putting pressure on emerging market dollar borrowers who were facing the prospect of repaying dollar debts with depreciating currencies. China has not been immune as well as it has been forced to sell dollars and diminish its vast reserves to support its currency. The prospect of higher rates in a very, very low rate world was resulting in The Fed backing the U.S. economy into a corner by helping to propel the dollar even higher. The Fed could no longer assume its policies would have no feedback effects on the U.S. economy. And yet all roads still seem to lead to oil which ultimately feeds back to the dollar. 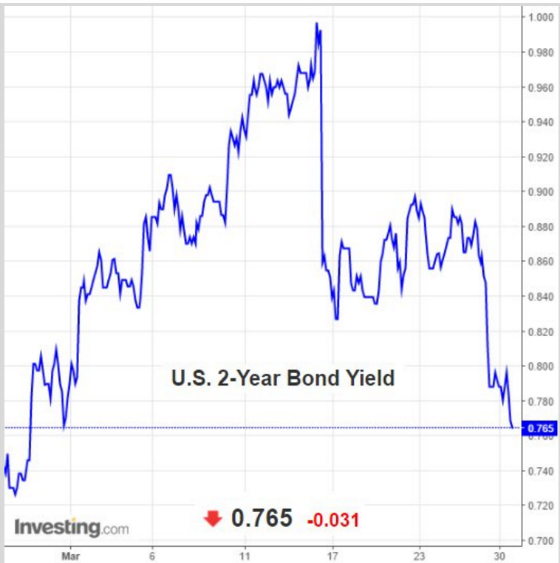 As the dollar weakens, oil rises, along with other commodities, and this helps the stock market as the following chart shows courtesy of @soberlook. It is worth noting, however, that there was a very big divergence on Friday when oil had a big drop and yet the stock market rose nicely. Maybe this correlation is lessening? There seems to be some outrage among a cadre of people that The Fed is now serving the devil of the market and ignoring labor market improvements and creeping inflation in setting interest rate policy by focusing on global forces. I would argue that they are naive and ideological. There are too many powerful global forces that, if ignored, will come back and bite the U.S. economy by hurting the labor market and creating more disinflationary pressures. I do believe The Fed is currently serving the right master. Who is the Fed Going to Serve? The Fed is ultimately trying to serve Main Street but at times, the destiny of Main Street can be closely intertwined with Wall Street. Savers are not happy but investors are. International firms are complaining but the American consumer is benefiting from lower import prices. Energy firms are hurting but many others have not received a de facto tax decrease as gas prices drop. Every action has consequences in which some parties benefit more than others and some may be hurt in the short run. Hopefully, the policies that are implemented are the appropriate ones to avoid unhealthy imbalances from developing such that over the long run the pie is growing and society as a whole is better off despite short-term costs to certain constituencies. Turning to Dylan one last time, I think he identified quite accurately many of the constituents The Fed is trying to serve. And the reality is that life is not always fair and not everyone benefits equally from Fed policy. Who does the Fed serve? Main Street or Wall Street? The FED ultimately serves capital and in doing so capital has gotten too expensive. The financial crisis was a referendum on capital. The real estate and stock markets were over-priced and the market corrected them. The FED along with TARP bailed out the holders of capital and overrode the market for the time being. Over valued capital is the underlying cause of inequality IMO. Capital is subsidized not only by the FED but also by the tax code. Until we are impartial to capital, inequality will continue. The FED has backed itself in a corner. It will be hard pressed to come to the rescue when the next market correction comes. The government will need to step in with a massive fiscal stimulus to combat the deflationary forces of globalization.